Hallie dreads attending youth group functions ever since a humiliating incident between her and the preacher's son Luke. But her parents think it's time to move on and force her to go on a church-sponsored camping trip. It starts off every bit as dreadful as she is expecting, in spite of an offer of friendship from a new girl named Rachel and some unexpected kindness from Jonah, one of her ex-friends. 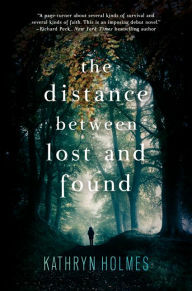 But the stakes change when Hallie, Rachel, and Jonah find themselves lost in the woods and struggling for survival. And the struggle becomes an opportunity for Hallie to redeem herself and fix her broken life. With a plot not-so-full of surprises, the quality of this novel turns upon Holmes's strong writing and strong characters. In the beginning, I found Hallie's whining pretty annoying (and I could easily see why she didn't have any friends anymore!) but that made her blossoming into a strong-willed protagonist that much more compelling. The romance with Jonah never quite reaches its full potential, but you've got a lot of action to plot out here and some things had to give. I also wanted a more cathartic ending, but Holmes got everyone to where they needed to be (physically and emotionally) by the end, so the story did its job. I found it bracing, but realistic and thoughtful. A great combination of emotional growth drama and survival story.